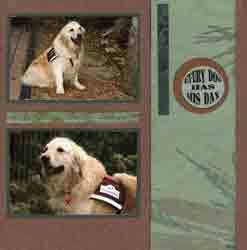 Here are a few layouts from a Canine Assistants Scrapbook that you can copy to honor that special member of your family into your scrapbooks. 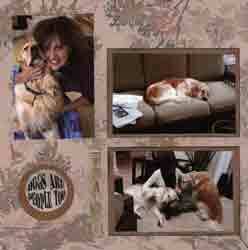 Do you have a fantastic canine that you need to do some dog themed scrapbook layouts for? Why not an entire Album? 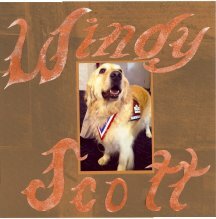 The Golden Retriever Windy Scott who is featured here in these layouts was for many years a Canine Assistant as her jacket proudly displays. 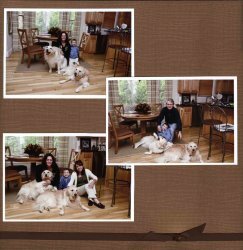 The photos of Windy depict her in her work as a Canine Assistant reading with children. Here, she even has her own book plate design. Other photos show her at home with her "people" family and as a mother with her "fur" families. 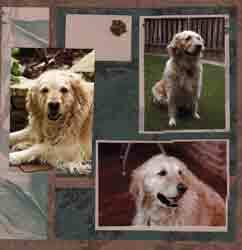 Many of her puppies have also been trained to be Canine Assistants so her legacy lives on and on. Windy is even famous. 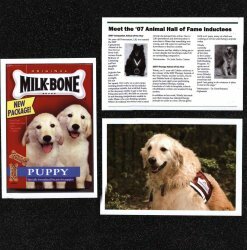 As you will see she has her own Hollywood Star, she was indicted into the 2007 Animal Hall of Fame, and is one of the puppies on the cover of the Milk-Bone Dog Biscuits package. Do you have this box in your home? 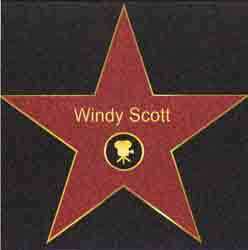 Materials Used: The Hollywood Star was a custom printed 12 x 12 from Scrap Your Trip.com. The right background sheet is a Black Glitter page from the Best Occasions Glitter pack available from WalMart. Materials Used: The background sheets and journal blocks are from a Black & White mixed media pack from Best Occasions available from WalMart. Mattes were black card stock. 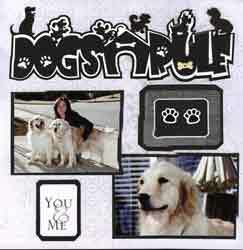 The "Dogs Rule" die cut was purchased from The Goose Bump Patch. 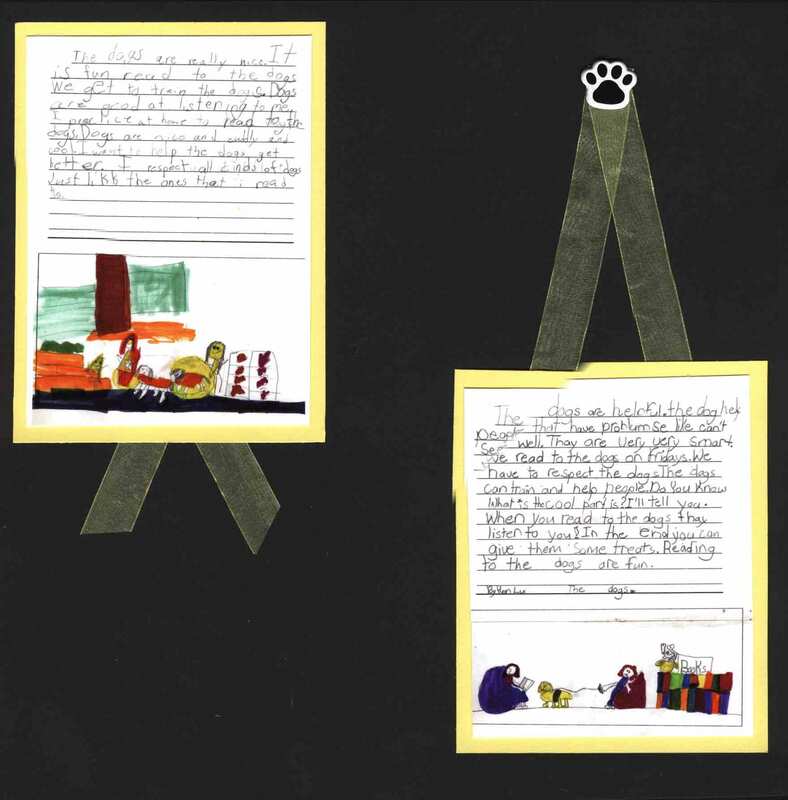 Other accents on the page include Paw Print brads and tan Dog Bone eyelets attached to the die cut and to a black paper strip. Here Windy is working as she sits while children read to her. She is very patient as the little boy in the photos pats her head and holds her paw. As the Canine Assistants Scrapbook notes, it takes a very special dog to be a Canine Assistant. 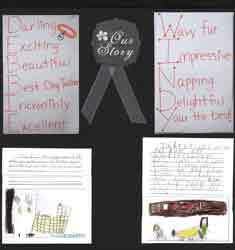 On the right is the invitation from the 2007 Georgia Animal of the Year Awards Ceremony where Windy was honored a Therapy Animal of the Year. Next to that is the cover of a book put together for Windy from the elementary school children where Windy worked. 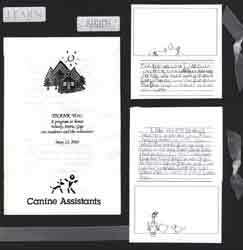 Materials Used: These Canine Assistants Scrapbook layouts are from Club Scrap's Academy Kit issued in August 2007 which has images of text as part of the background. Perfect for Windy at Work. The embellishment on the left page is a "book plate" and other accents include blue and burgundy ribbons and a pre-printed tag that says "Today is YOUR special day!" Materials Used: The background for both sets of layouts were plain black cardstock from the Best Occasions black paper stack available at WalMart with the "learn" and "share" and "Our Story" stickers from the Best Occasions Black & White mixed media stack. The white organdy ribbon was from the Club Scrap Sparkle kit from December 2007. More pages from the Windy's book. 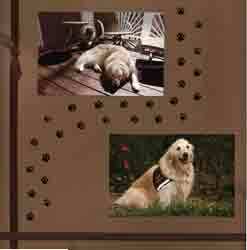 Materials Used: The background for these Canine Assistants Scrapbook layouts is plain black cardstock from the Best Occasions black paper stack available at WalMart with additional yellow card stock to match the colors of the book pages. 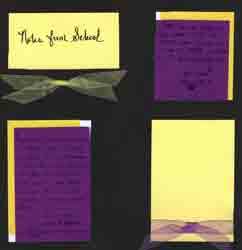 The yellow and purple organdy ribbon was purchased from Close to My Heart in a collection called Summer Carnival. The one remaining Paw Print brad is used to anchor the yellow ribbon. Materials Used: These two Canine Assistants Scrapbook layouts were from the Club Scrap Outdoor collection available from Independent Crafters who sell their Food For Craft line. 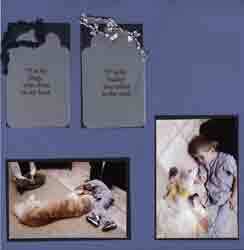 The only embellishments are several brown Paw Print brads and one journaling circle from Quick Quotes. Windy at play with family. Materials Used: Background card stock by Bling in a medium blue - this has a slight metallic sheen. Mattes were navy metallic paper from Club Scrap's Sparkle kit from December 2007. The Twist Ties printed with journaling "Joy is not in things, it is in us" and "Together is a wonderful place to be" were from the Club Scrap Friendship kit from April 2004. Windy at home with her family. 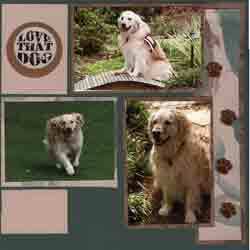 Materials Used: The Background card stock for these Canine Assistants Scrapbook layouts is from Die Cuts with a View Metallic Paper Stack is a copper color. The brown satin ribbon is from Club Scrap's Sparkle kit from December 2007. The paw prints were stickers from Stickopotomus. Materials Used: These two layouts were from the Club Scrap Outdoor collection available from Independent Crafters who sell their Food For Craft line. 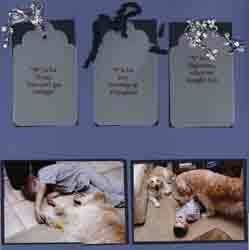 The only embellishments are two journaling circles from Quick Quotes "Dog Quotes". Windy at home with three of her four litters - Windy has made sure that Georgia has talented therapy animals for years to come. She has given birth to 41 pups, many of which have followed in her paw prints and are working as service and therapy animals today. 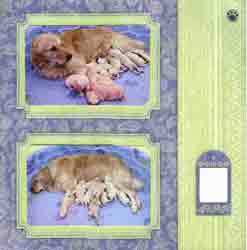 Materials Used: These two Canine Assistants Scrapbook layouts were from the Best Occasions Quick Page Book of Pre-made Layouts. The only added embellishments are the Paw Prints from Jolee's. Windy relaxing with one of her favorite family members. Materials Used: These two Canine Assistant Scrapbook Layouts used a medium blue "Bling" card stock for the background along with a Navy Blue Metallic Plan paper from the Club Scrap Sparkle kit from December 2007. The tags are A-B-C tags for Dogs from Kellers Creations matted with the Navy Blue Metallic and attached with navy and white fibers from the Sparkle kit. The A-B-C Tags spell out Windy's name. "W" is for water, you can't get enough"
"I" is for Icky, cleaning up your mess"
"N" is for Nighttime, when we snuggle, too"
"D" is for Dogs who chew on my boot"
"Y" is for Yucky! You rolled in the mud"
Canine Assistants is a program founded in Alpharetta, Georgia, in 1991. 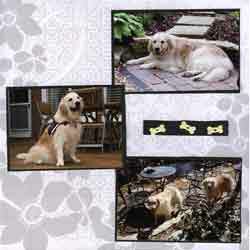 The Canine Assistants Scrapbook page hopes to promote this nonprofit organization which is dedicated to providing service dogs to children and adults with epilepsy, physical disabilities, and other special needs. Canine Assistants' service dogs open doors, pull wheelchairs and turn on lights. But the most important contribution the service dogs offer is the self-esteem and happiness they create - and the social barriers they help remove. 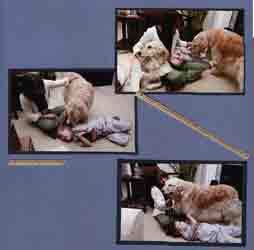 Learn more about Canine Assistants. Released August 10, 2010 Through a Dog's Eyes is a documentary based on Jennifer Arnold's book by the same name and focuses on the human-canine bond as told through the moving stories of service dogs and the people whose lives they have changed. This film will transform how you see your dog, by understanding how your dog sees the world. Check out the trailer at Through a Dog's Eyes. Don't forget to purchase Jennifer's book Through a Dog's Eyes online at these fine retailers - Amazon, Barnes & Noble, Borders and Indie Bound. 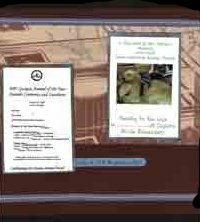 You can find links to Jennifer's book from each retailer at the following: Canine Assiatants "Through A Dogs Eyes"